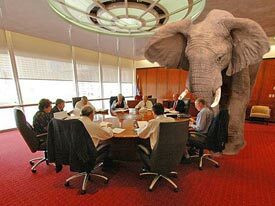 "The elephant in the room" ... I love that expression. After all, my two little girls enjoy watching the elephants at Lion Country Safari, and they'd love to see 'em show up in the living room. But right now, the real five-ton elephant in the room is inflation. And no one at the Federal Reserve really seems to want to confront it! I mean, here we are in the midst of one of the most aggressive interest rate cutting cycles ever. The Fed has slashed rates from 5.25% to 3%, and Wall Street is clamoring for another percentage point of cuts ... at least. Yet hot-off-the-press figures show that inflation is going through the roof. Take a look at the chart I made. It shows the year-over-year change in the price of imported goods. You can see that prices skyrocketed 13.7% in January. That's the single biggest increase since the government started keeping track in 1982! In just one month, import prices surged 1.7%. And even if you strip out petroleum, you'll see imports were up around 3.6% from year-earlier levels. That means the old, tired "it's just oil prices" argument is a bunch of baloney. Most importantly, the price of Chinese imports jumped 0.8% on the month. That's the biggest one-month gain on record! Why is that such a big deal? Cheap Chinese goods have helped keep U.S. inflation lower than it would otherwise be. Now that the cost of those goods is rising, a formerly deflationary force is turning into an inflationary one. On Wednesday morning, the latest Consumer Price Index figures hit the tape. Overall prices rose 0.4% on the month. The "core" CPI, which strips out food and energy, gained 0.3%. That was the biggest jump in 19 months. And transportation prices jumped 0.5%. In fact, the year-over-year rate of inflation is now officially hovering at 4.3%. Core inflation is running at 2.5%, well outside of the Fed's 1% to 2% preferred range. And these are JANUARY figures! They don't even capture the impact of the latest surge in commodity prices that has occurred so far in February — the one that Sean and Larry have been covering so well. Fed officials occasionally throw a few platitudes out there about how they're concerned about inflation. But actions speak louder than words. And frankly, the Fed's aggressive cuts — in the face of $100 oil, $900+ gold, $10+ wheat, $5+ corn, $13+ soybeans and so on — tell you everything you need to know about the Fed's commitment to fighting inflation. Policymakers are trying to ignore the elephant in the room — inflation. Policymakers are trying to ignore the elephant in the room because they're more worried about shoring up the ailing U.S. credit markets. They're hoping the market will just play along with the charade, accept the cuts as a necessary step to save the banks' bacon, and pay no attention to the potential long-term consequences. But bond traders are NOT buying it anymore! In fact, they're selling. Long bond futures prices fell a bit more than seven points from their intraday high on January 23 through their low this week. That's the market's way of telling the Fed that aggressive, short-term interest rate cuts could drive longer-term inflation — and long-term interest rates — higher. If it were just bond investors getting hit, maybe this wouldn't matter except to some Wall Street investment firms. But the rise in long-term rates could also be yet another headwind for the housing market. You see, rates on longer-term mortgages — think 30-year fixed rate loans — follow rates on longer-term bonds. They do NOT move with the federal funds rate, which is what the Fed has been cutting. That means the Fed cuts, designed to help housing, are having the opposite effect — they're driving financing costs on 30-year mortgages HIGHER . In fact, figures from the Mortgage Bankers Association show that 30-year mortgage rates have increased from 5.5% in mid-January to 6.09% in mid-February. That surge caused mortgage application activity to plummet in the most recent week by more than 22%. In fact, the MBA index that tracks home purchase loans fell to its lowest level since early 2003. Believe it or not, I sympathize with the Fed. I'm glad I'm not in Ben Bernanke's shoes. If he cuts rates too much, he risks driving longer-term inflation higher. If he cuts them too little, the economy could slump even further. But over the LONG-TERM, the Fed has to put inflation-fighting first. That should be the primary focus of any central banker. I believe that the Fed needs to let us have a cleansing recession ... let the economy go through a natural period of sub-standard growth ... and allow the financial industry to work its problems out mostly on its own. Yes, that might mean letting some banks fail. But eventually, prices would come down, inflation would fade as a threat, and the stage would be set for a healthier long-term recovery. Look, throwing easy money at the tech bust just gave us a housing bubble. And now, throwing easy money at the housing bust could very well be giving us another bubble in commodities. Is that really a path we want to go down as a country? Haven't we seen this movie before? Don't we know how it ends ... with too much rate-cutting and money pumping just creating new problems to replace the old ones? I can only hope that the Fed starts to recognize inflation for what it is — an economic elephant sitting in America's living room. P.S. We recently made our presentations at the Orlando Money Show available online, and the response has been incredible. If you haven't had a chance to view my segment on the credit markets yet, you still have time. Just make sure your computer speakers are turned on, and click here . This investment news is brought to you by Money and Markets . Money and Markets is a free daily investment newsletter from Martin D. Weiss and Weiss Research analysts offering the latest investing news and financial insights for the stock market, including tips and advice on investing in gold, energy and oil. Dr. Weiss is a leader in the fields of investing, interest rates, financial safety and economic forecasting. To view archives or subscribe, visit http://www.moneyandmarkets.com .